Over the last few years, there has been a noticeable interest in fintech companies and startups. Some questions received by AdvisoryHQ news from our readers include what is fintech? What is a financial technology company? And what’s a good definition of fintech. Based on this level of interest, we decided to perform a detailed level of research and publish this article which provides a detailed fintech definition and an overview of the fintech startup sector. The fintech definition is a combination of the words “finance” and “technology” and is used when describing tech-based financial services. 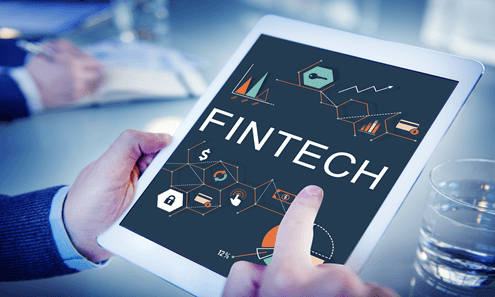 Although the word fintech is not as well known, even among those in the technology and finance industries, it affects nearly all of us on a daily basis. Technology has revolutionized the way we pay bills, manage money, invest, and shop. While many of the companies that define fintech are startups, the industry isn’t limited to new businesses. 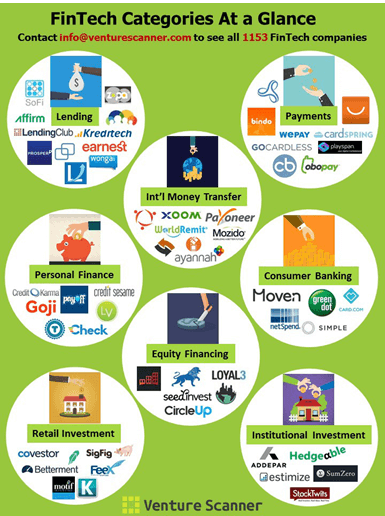 Image Source: What is Fintech? 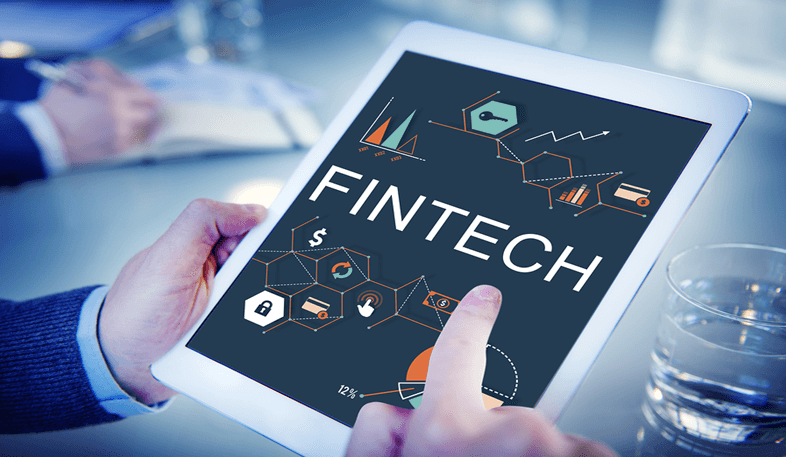 Investopedia expands on the idea of fintech including any technology in the financial industry, making it an incredibly broad category. Everything from mobile banking to crowdfunding falls under the fintech definition. With the industry new on scene but quickly growing, many are still left wondering how fintech will impact business, personal finance, and the future of commerce. After learning the fintech definition or just hearing the phrase itself, most of us think of banking apps and online money management. However, asking the question, “What is fintech?” really starts with much earlier technology. 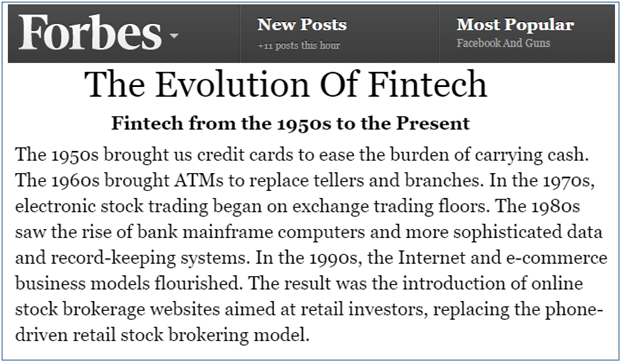 Credit cards are the first example given in a timeline, put together by Forbes, outlining the fintech industry. Later, ATMs and, eventually, computers in banks changed the way we deposit, withdraw, and save money today. According to the New York Times, the term “fintech” was made official in 1993. As the Internet grew, fintech followed. Fintech startups popped up, offering alternative options to traditional banking and money management. Over time, financial technology has evolved from the alternative to the norm. In 2015, more individuals chose mobile banking options than banking at a physical location, according to the New York Times. Lending covers a spectrum of personal loans, including peer-to-peer lending, allowing individuals to offer loans to other people or businesses through services that match lenders and borrowers. Payment services allow for easy online payments, making online shopping for goods and services quick and simple. PayPal is the most recognizable of these services, allowing for an easy exchange of currency online. International money transfers are taking the place of traditional money wiring through services like Western Union. Personal finance includes financial technology that allows users to take control of their budgets. Sites like Mint help individuals to see where their money is coming from and where it’s going each month. Consumer banking involves electronic banking as an alternative using physical banking services. Many traditional banks are meeting the demand by creating mobile banking apps for their customers. Equity financing allows consumers to invest in products, programs, and companies. What is financial technology adding to investments? Crowdfunding is one huge area, bringing individuals together to support projects. Retail investment gives individuals access to investments to build their personal financial portfolio. Online resources and easy-to-use programs make investing easier than ever, giving users more freedom to take control over their investments. Institutional investments include investments that are done for a group on a larger scale. These investments include pensions and mutual funds. When discussing fintech, one word that is heard over and over is bitcoin. Bitcoin.org explains that the idea was created in 1998 by Wei Dai. The idea was put into practice by Satoshi Nakamoto. The concept was to have a new type of currency that was completely digital and transferred directly between individuals, just like cash is used in physical transactions. The idea is still young, but more and more businesses are using this financial technology to give and receive payments. In theory, the digital payment method is a way to simplify payments. By not using credit or debit cards, personal information isn’t exchanged and, therefore, there is no security threat. Payments are made from computers and smartphones instantly through a digital wallet, making it an easier process than entering a card number. 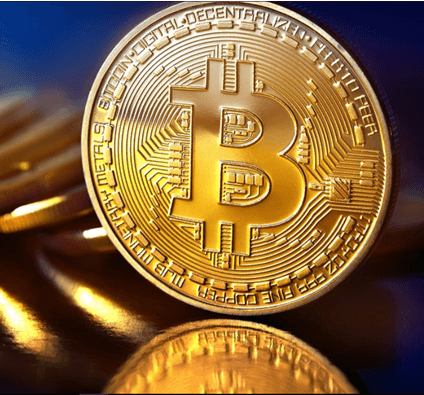 Currently, most businesses aren’t accepting bitcoins as payment, and seeking out companies that does use the online currency will lead to random results. According to Market Watch, OKCupid and Zynga are among the companies jumping on the trend. However, many others are hesitant about this particular financial technology. What Is Fin Tech Doing for Businesses? An obvious question, when discussing the merging of finance and technology, is what is fin tech doing to change the business world? The industry may be young, but it has changed the game within the past few years. An article from business.com uses the buzzwords “efficiency” and “accessibility” when discussing the impact that financial technology is making on businesses. Technology has obviously helped businesses to reach an infinitely larger audience with great speed. A social media post, for example, can reach millions of potential customers in a split second. What is fintech doing after that audience is reached? It’s making it easier than ever to sell products and services, accept payments, invest money in the company, and grow the business. With rising technology, like bitcoins, the process may soon be sped up even more. While there are certainly wrinkles to iron out for digital currency and online payment methods, the developments have already revolutionized the way transactions are completed. The greatest impact on businesses may be for startups. Crowdfunding has made it possible for any idea to be taken to the next level with financial support. Any business idea can be presented online and funded by investors in record time. Financial technology is making it possible for nearly anyone to become a business owner by connecting those with ideas to those with the money to turn ideas into reality. Nonprofits are also finding ways to use fintech effectively. The National Council of Nonprofits offers a guide for organizations to make use of some of the new and exciting tools. These organizations can also use crowdfunding as a valuable tool for fundraising. Free and inexpensive banking and payment apps can change the way nonprofits handle accounting and donations. What Is Fin Tech Doing for Individuals? If there is one benefit that fintech is offering to individuals, it’s the freedom to take control over personal finances. What is financial technology doing to promote independence with finances? It’s giving individuals control over everything from depositing a check to managing an investment portfolio to saving money for a down payment on a home. Financial technology is making money management accessible in a way that it never has been before. Mobile banking, budgeting apps, and digital wallets are literally putting money management at our fingertips. It can be extremely empowering for individuals to take control over where their money is going. Convenience is another key for individuals when it comes to fintech. What’s more convenient than tapping an icon to see your bank account balance or swiping a finger to send money to a family member thousands of miles away? Learning apps are aiming to make financial technology even more convenient while also serving to generate business. Investopedia explains that learning apps use data collected about an individual’s habits and interests to offer personalized suggestions and promote spending. While this can certainly be seen as a benefit to businesses, it can also be convenient for individuals who will be able to easily find the content, products, services, and businesses that best fit their lifestyle. Fintech isn’t solely a self-centered industry. Leaders in the field are finding ways to make it a tool for bringing financial freedom to those who may otherwise lack resources. What is fin tech doing to give back? Investopedia includes a comment from Nasir Zubairi from FinLeap about using technology to educate individuals about credit and banking. Online services can be found to get free credit reports, learn about saving, and work toward being debt-free. What Are the Downfalls of Fintech? For most technology startups, the goal of a product or service is to make life easier for consumers. Fintech startups are no exception. By creating apps, software, and new technology, the goal is to simplify money management. Technology is a rapidly-changing and growing industry. So fast, in fact, that regulators are having a difficult time keeping up, according to Forbes. When transactions are completed with the click of a button and accounts are created with the simple creation of a username and password, there’s little time for rules and regulations to be created. What is a fintech company going to do to keep order and ensure cyber safety for users? As with all online companies, fraud and identity theft are a big concern. As regulations are created and enforced in a more uniform way, these issues may become less overwhelming, but they will most likely always be a concern for everyone involved. When personal information is entered, stored, and accessed so easily, there will always be a reason to proceed with caution. With theft and fraud concerns comes a conversation about cyber security. When dealing with financial technology, security and insurance take on all new meanings. How is sensitive customer information protected? What happens if that information is leaked or stolen? How are customers reimbursed for damages? These are all questions that businesses have to answer, but the answers may not yet be clear because the technology is so new and evolving so quickly. As the tech world continues to grow, fintech startups will continue to rise up and existing companies will invest more resources in expanding their technology. An article from Inc notes that many fintech startups are being bought up by larger companies, like Mint, a powerhouse in financial technology. These companies are capitalizing on the ideas of enthusiastic young tech entrepreneurs. The future of financial technology seems bright, but there is certainly some opposition. Not surprisingly, much of the criticism of fintech comes from those who are invested in traditional banking. These critics cite consumer privacy and lack of regulations as two of the main causes of concern. As fintech continues to grow with no signs of slowing down, traditional financial institutions are finding ways of following suit. An article from The Economist outlines the competition between fintech startups and established banks, in particular. Traditional financial institutions are at a point where they have to make a choice: to embrace the change and cooperate with fintech or fight back with competition. Fintech came into existence at just the right time. It’s a time when a new generation of consumers has developed a desire to take control over their own finances and when technology is dominating day-to-day life. The question is whether fintech will continue to grow and overtake traditional finance or whether the two can coexist while embracing their strengths and respecting their differences.